For the British lawyer and politician, see Frederick Low (British politician). Frederick Ferdinand Low (June 30, 1828 – July 21, 1894) was an American politician, US congressman and the ninth governor of California. Born in Frankfort (now Winterport, Maine) in 1828, Low attended the Hampden Academy in Hampden, Maine. Low moved to California, entering the shipping business in San Francisco in 1849. Low became a banker in Marysville, California from 1854 from 1861. Low presented credentials as a Republican Member-elect to the 37th Congress but was not permitted to take his seat until a special act of Congress was passed. He served as a member of the U.S. House of Representatives from June 3, 1862 to March 3, 1863. 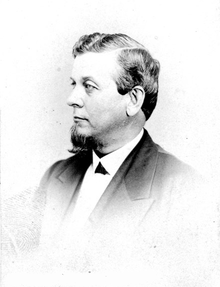 Low was appointed in 1863 as collector of the Port of San Francisco prior to becoming governor of California from December 10, 1863 to December 5, 1867. He was the second California governor to live in the Stanford Mansion as the official residence and office until the opening of the California State Capitol in 1869. Low was California's last Civil War governor. Hallmarks of his administration were the establishment of Yosemite National Park and University of California. Low was considered, father of the University of California, however, his successor, Henry H. Haight signed March 23, 1868, the Charter of the University. Low served as United States Minister to China from 1869 to 1874. He died in San Francisco on July 21, 1894. He is buried in the Cypress Lawn Memorial Park in Colma. ^ Department of Parks & Recreation. "Stanford Mansion History". State of California. Retrieved 2007-05-02. ^ State Capitol Museum. "Frederick Low, 9th Governor (1863-1867)". State of California. Archived from the original on 2007-08-13. Retrieved 2007-05-03. United States Congress. "Frederick Low (id: L000469)". Biographical Directory of the United States Congress.